Paint with a jovial ardor a particular day of your loved one by presenting the person this Inspiring Funs Pack and let happiness jingle inside the person. This is a brain-chilling Collection of Collection of Nestle Kitkat 4 Finger (1 Bar), Kinder Joy (3 Pcs. 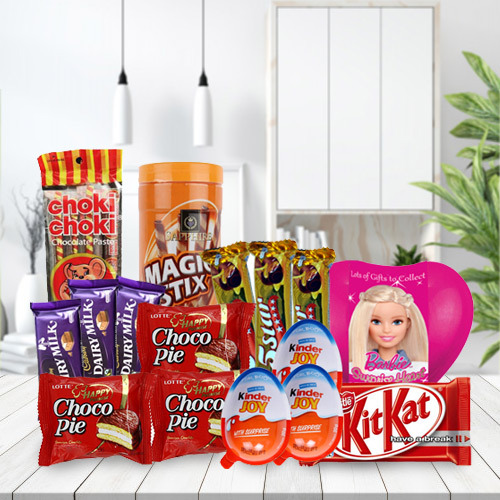 ), 3 Small Packs of Chocopie, Cadbury Dairy Milk (3 Bars), 3 Small Bars of Cadbury Five Star, Choki Choki Chocolate Paste (5 Sticks), Sapphire Magic Stix Chocolates Container and 1 Surprise Box of Small Toys.